Soundwave and Rumble Are (on her) Back! 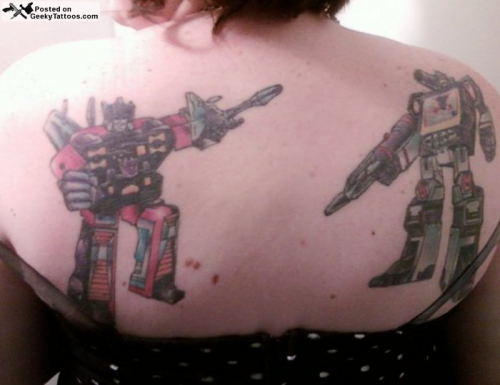 Rachel says she got the tattoos you see above because she’s been in love with Transformers since she was “a wee little girl”. She thinks Soundwave is the biggest badass of them all and says Rumble is the one she most personally identifies with. She pointed out that she went with the old school “boxy” style instead of the newer style. I think old school is always the right way to go, especially when it comes to the classics like Transformers. Tattoos done by Adam Rosenthal at Th’ink Tank Tattoo. Posted in Cartoons, Tattoos, Transformers, TV. Tagged with Adam Rosenthal, back, Rumble, Soundwave, Think Tank Tattoo, Transformers.